Studies show a close connection between dental hygiene and a person’s overall health and well-being. According to the website Mayoclinic.com, “Your oral health may affect, be affected by or contribute to various diseases and conditions, including the following: endocarditis, cardiovascular disease, premature birth and low birth weight, diabetes, HIV/AIDS, osteoporosis, Alzheimer’s disease, and others. Preventive care is critical to maintaining your health and avoiding diseases, such as periodontal disease. Dr. Santilli is your trusted general dentist who will help monitor your health through regular cleanings and exams. Your first visit with us will include a comprehensive dental exam that screens for issues such as tooth decay, bone loss, tumors, cysts, oral cancer, and gum disease. During the dental cleaning procedure, one of our trained dental hygienists will remove any tartar and plaque and polish your teeth. You’ll be reassured to know that we care for our patients. 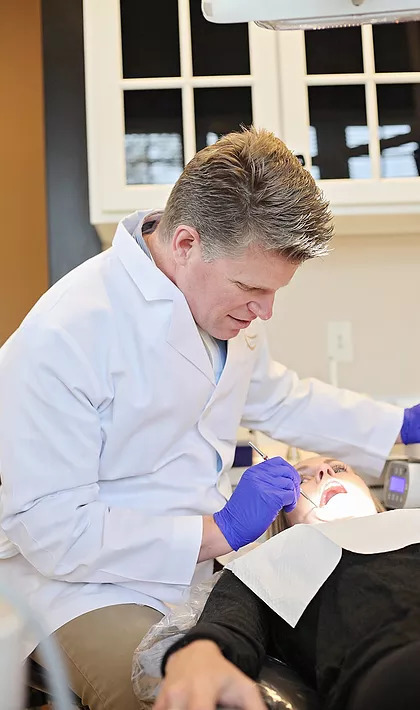 What makes Dr. Santilli one of the top family dentists in Columbus, Ohio is our combination of state-of-the-art dental technology, such as laser dentistry tools, digital x-rays, and a computer-assisted tomography panoramic scanner, with personal experience and skill. Just like you, we struggle with busy schedules and want to respect your time, so we pride ourselves on being punctual for our appointments, barring any emergencies. Our desire is that our dental office be a respite from the hectic pace of your day. Our general dentistry office is designed to look and feel like a home rather than an office. A warm, soothing palette of colors, comfortable reclining chairs, and a refreshment station create a peaceful, relaxing environment. We also offer several amenities during your general dentistry exam, such as deluxe examination chairs, warm face towels, TVs and headsets, and blankets.